The Seattle region's white collar, tech, and warehouse/logistics sectors are heavily concentrated in King County. In fact so are jobs overall. In your example, $20 worth of landscaping services was produced by two individuals. The total economic output of these individuals was $10 per capita. OP, thanks for posting. These numbers give the first chance to pinpoint true GDP at the CSA level since you can break down the numbers for every county. In doing so, I added up the CSA numbers. 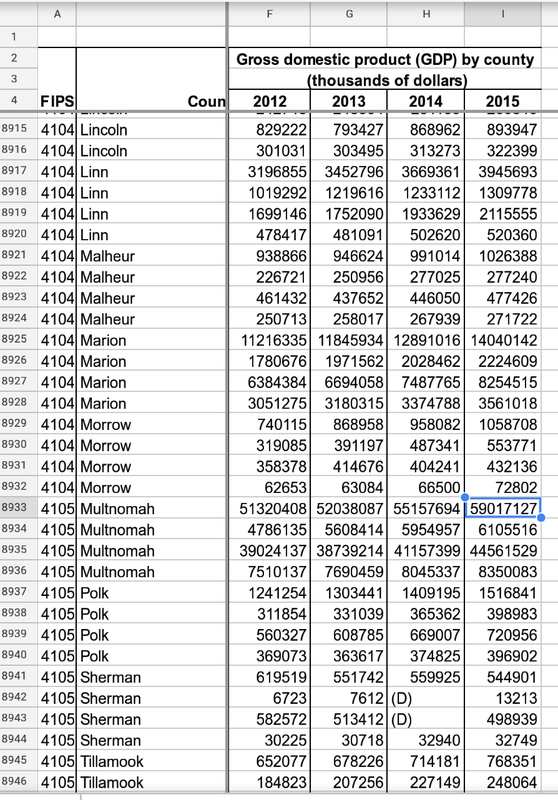 Last edited by ClevelandBrown; Today at 02:07 AM..
OP, I don’t see Multnomah County anywhere in your stats. Did you overlook Portland? I’ve read through it a couple times. I have it at 59.017 .. which puts it between Milwaukee and Duval (Jacksonville, Fla.). I'm not the OP, but looks like a simple omission because Washington County is listed. Thank you for noticing that. Indeed I goofed. The highlighted cell is the gdp for all industries in 2015. I hope that they do manage to undo the Great Divorce, but I must confess that it puzzles me that the effort that has the greatest momentum would require everyone in Missouri to sign off on it in a referendum. As I recall reading one critic of Better Together's effort saying, "Why should someone in Kansas City have a say on how St. Louis is governed?" But Philadelphia does remain the region's largest employment center. King of Prussia in Montgomery County is its second-largest, true, and the second-largest edge city on the East Coast after Tysons (Corner) in Virginia. And the job growth curve in Philadelphia County finally turned upward in the last two to three years. It did surprise me somewhat to see New Castle County, Del. (Wilmington) rank higher than Jackson County, Mo. But Jackson County includes only the oldest parts of the city of Kansas City, which also extends into Clay, Platte and Cass counties. However: it seems that the other counties have GDPs of under $20 billion. From what I could see, the only two Greater Kansas City counties that have GDPs above that threshold are Jackson in Missouri and Johnson in Kansas. What this says is that many of our suburbs have ceased to be bedroom communities. Great work. Yes finally we can accurately tabulate the accurate CSA gdp. The 2019 release will also include CSA data in bea's online search.